I would like to create a list in PWA so that I can have users fill in the information that I need in order to create a new Project. I don't see how to create a new list that is not attached to a project. Any ideas? This seems quite basic. Is this documented somewhere? I could not find on technet. Following instructions from the Project online. Go to the project online root site. Go to the site contents from the gear icon. You will find a '+ New' option to create a List/Library/App/Subsite. The 'List' option used to create a new list. Make sure you have at least Edit rights on the site. Let me know if I am out of your questions. I would like to create a list in PWA so that I can have users fill in the information that I need in order to create a new Project. 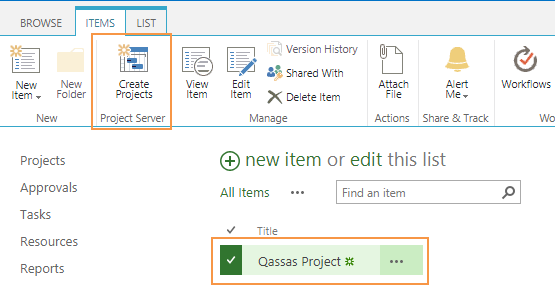 Create a custom list with at least the mandatory fields of Project custom fields. Add a new item to your list, select your Item. Not the answer you're looking for? Browse other questions tagged project-server pwa project-online or ask your own question. PWA 2013: How to add a column to the project scheduler? Is it possible to copy an entire project using the Project Server 2016 REST API?